Somehow, I figure that would have been a better title for the series finale of Bates Motel, though The Cord does bring everything full circle from the premiere episode. Here we had to wrap up everything, and somehow for me things did not end particularly well. It felt a bit unfair, a bit underwhelming given everything that has come before. 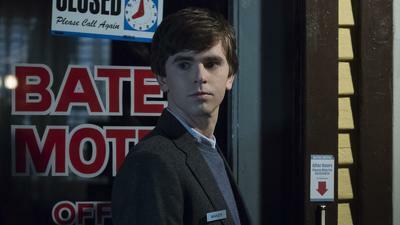 For me, The Cord was probably the worst Bates Motel episode, and given that it's the last one, it ended on a weak note. Sheriff Alex Romero (Nestor Carbonell) has forced his nemesis, Norman Bates (Freddie Highmore) to take him to the body of his late wife, Norma. Norman, still as sarcastic as ever (referring to his former stepfather as "Sheriff Lonelyhearts") does so. A devastated Romero beats Norman within an inch of his life, then stops to cradle the body. Bad move, as this distraction is enough for Norman to get a rock, beat Romero with it, then shoot him dead. Despite having been shot multiple times, even in the head if memory serves right, Romero STILL lives (a latter-day Rasputin), telling Norman that he is a sick man for murdering his own mother. Sheriff Jane Greene (Brooke Smith) doesn't care what happens to Norman, but she is extremely worried about what could happen to her deputy, Regina (who was also taken by Romero). This lack of empathy angers and worries Norman's half-brother/uncle Dylan Massett (Max Thieriot), who is desperate to get Norman the help he so desperately needs. Unbeknown to anyone, Norman casually gets Norma's body and drives back to the hotel, where even more surprisingly he manages to get a guest and her two sons to check in. More than likely this situation would have continued, perhaps completely unknown if not for the fact that Norman calls Dylan to invite him to dinner. Dylan is shocked at all this, especially since he realizes that Norman is so far gone he thinks he's basically started over and that what has happened in the past five-odd years hasn't. Dylan, against the advise of his wife Emma (Olivia Cooke) goes to the house and doesn't tell the police. There, Dylan finds Norman completely divorced from reality, making dinner while their mother's corpse sits there, causing Dylan to vomit in horror. Dylan really tries hard to tell Norman that Mother is dead, that none of this is real, and that he needs to get help; Norman won't hear this, and gets a knife. Dylan has come with a gun courtesy of his old friend Remo, and is forced to shoot his brother. Norman whispers a soft 'thank you' while Dylan tearfully cradles his brother in his arms. We see Norman and Norma 'reunited' joyfully in some ethereal world, and Dylan, Emma, and their daughter are now happy in a sunny Seattle. Somehow, a lot of The Cord rang false for me. Of particular irritant was the idea that Norman and Norma would reunite happily in the afterlife. Now, as someone who does believe in an afterlife, I don't object to that per se. I object to the idea that Norman should get a happy ending. Yes, he was disturbed, with serious mental issues. He was also pretty cold-blooded, selfish, and unrepentant. He wasn't under Norma's control when he killed Sam Loomis or Sheriff Romero. That was all Norman. Why then am I supposed to accept that he can get a happy ending? That just didn't sit right with me. I also had a hard time believing that there would be no checking at the Bates Motel itself by the police, or that Norman could just waltz back to the hotel and open it up, or that some woman who happened to stumble into the hotel would believe some random person that knocked on her door and told her to get out because the nice young man that checked her in is really bonkers, or that a man who has been shot more than once could still find time for a final monologue. That whole Romero business was something else that never sat well with me. Why didn't Romero just shoot Norman, or at least tie him up or put him in the trunk of the car while he mourned? And again, after getting shot again (having made a near-miraculous recovery from the last time he was shot), he still has enough within him to taunt Norman with his Joker-like look? Why didn't Emma call the police if Dylan refused to? Norman, even in a state of delusion, killed her mother, so it isn't as if she was going to be particularly sympathetic to him. No, a lot of The Cord felt as if things just had to be wrapped up. There were ten episodes to set up a good, proper ending. Somehow, I felt it wasn't a good and proper ending (even with Norman finally dead and buried: 1995-2017). I can't say much in terms of performances except that Highmore and Thieriot were good: typical for the former, slightly atypical for the latter. Somehow, I was disappointed by The Cord. It just didn't feel like an ending, but a finish, a way to just close out a series because you had to. Good thing too, because if it hadn't been the final season, I probably would have stopped watching after this episode.